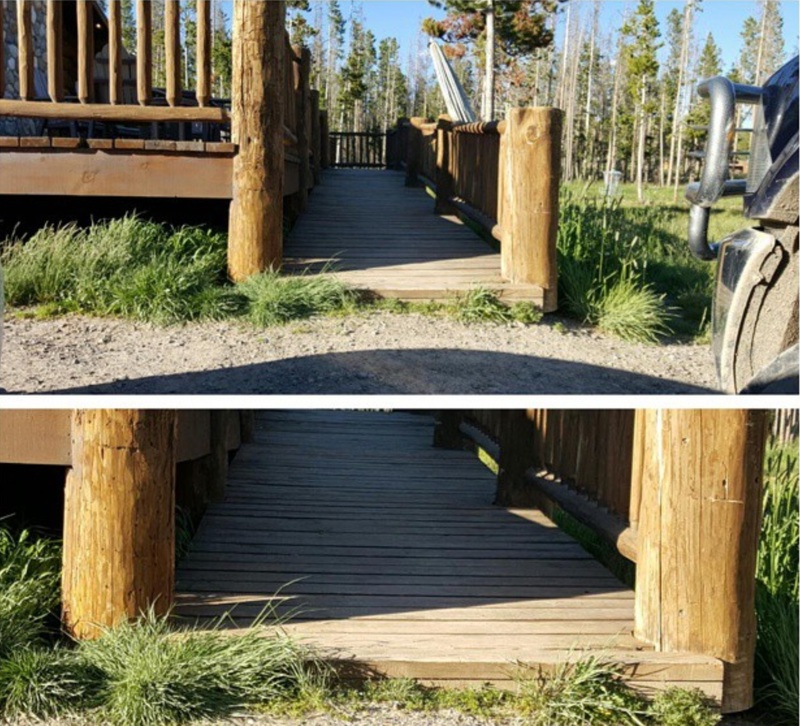 My take on Wyoming’s theory of accessibility is “Look, we’ve given you a ramp. You figure the rest out.” There are ramps, but many have inch or more lips. Or the handicapped spots at curbs don’t often have ramps to get onto said curb. Don’t get me wrong. I love this state. In fact, I seriously want to move there. It just isn’t for the faint of heart. A state full of hearty, hard-working people means that they don’t roll over (pun intended) when adversity hits. Many places have gravel drive-ways and roads. This is hard to wheel over. Hard, but not impossible if you have upper body strength. The hubs tried to help me so many times. But I would always snap at him to not help me. He probably looked super rude to other people. The kindly cowboys probably judged him for not pushing me. My motto is: I don’t need no stinkin’ help. Maybe I should have that made into a t-shirt. Or a bumper sticker for my wheelchair. And he can just point to it when people look. For all of the accessibility drawbacks, Wyoming is so nice. The people are beyond nice. If there’s a place I can’t go, I’m sure someone would offer to pick me up and carry me. In fact, that kind of happened. At one touristy spot, the ramp was so steep and the doorway so narrow that I needed not only the hubs to help, but a complete stranger. She’d asked me several times to help and I turned her down. When she saw us struggling she finally just came over and helped. I felt so bad, but I guess I need to start realizing that some people genuinely want to be helpful. It’s hard to not feel like you’re putting them out. I refuse to ever be a burden. 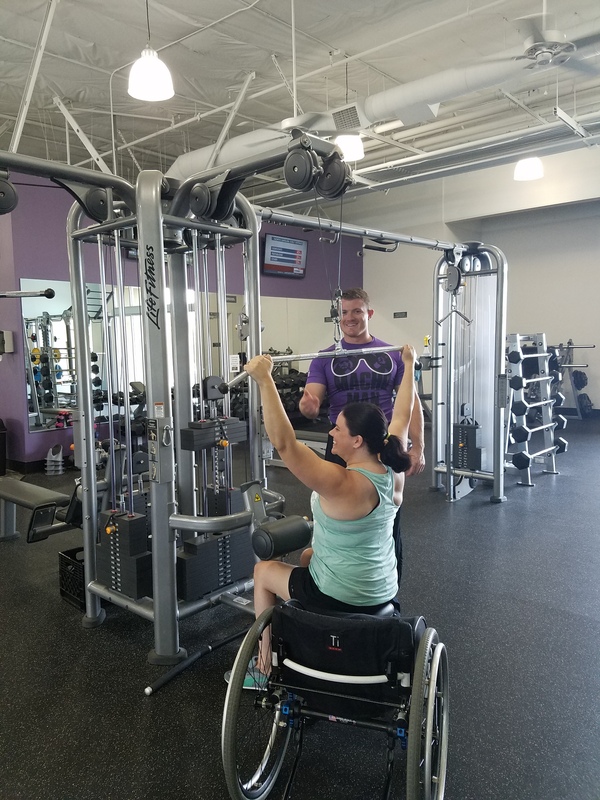 Maybe I’m going to start a new exercise trend called the Wyoming Wheelchair Workout. Wcubed. Everyone gets a wheelchair and pushes for 2 miles up and down hills on a gravel road. I did that once (and in the name of honesty, it was only 1 mile) and I was sore for 3 days. It was amazing! I’m going to do a video and write a book about it. Get some celebrity endorsements. This workout is going to make me millions! No one steal my idea. Today was day 3 at the gym. 3 days in a row! I think you get a medal when you go 3 days in a row, right? Yesterday we went in the afternoon and the gym was full of big muscly guys. I think I prefer going in the morning where it’s more women and older people. That’s more my speed. I’m not quite at the “lift 300 pounds and grunt really loud so that everyone knows you’re lifting 300 pounds” phase. Give me a couple weeks. One of my clients is a big muscly guy and has promised to train me once I win his case. I’ve bartered with him- I won’t charge him anymore for his case and he will train me. He said he’d train me for free if [WHEN!!!] I win his case. I have 2 witnesses to hold him to that! This morning the owner of the gym was there and was super excited that we were there too. I know this because he exclaimed “HI!” and waved with both of his arms over his head. Not quite a 3-day medal, but close. I’ve learned that people are more awkward around me at the gym. They don’t want to crowd me or offend me by assuming things. Case in point: This morning I was using weights in a free weight area. I happened to be next to a balance ball apparatus. It’s the thing that looks like half a balance ball with the bottom being a flat board. (In looking it up, I see it’s called a Bosu Ball.) I think you stand on it and try to balance. 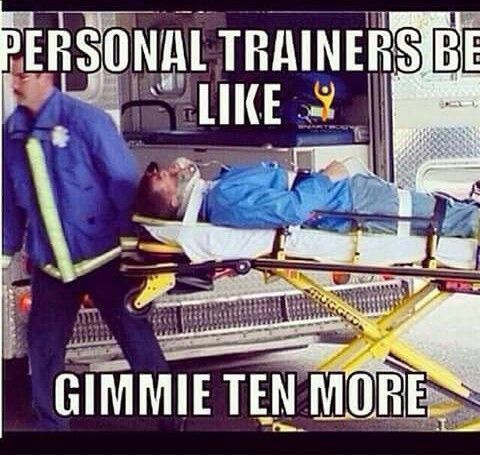 I used one back in the day during PT (like 2006). I was never any good at it. Anyway, a woman came up to me nervously asked if I was using it. I tried to not laugh when I said “no” because she was so sincere and nice about it. She probably felt awkward because it was right next to me and didn’t want to offend me by assuming that I couldn’t use it. This made me realize that people generally are nice. And respectful. And nonjudgmental. She could have easily just assumed I wasn’t using the thing. But she was worried about hurting my feelings. That was very nice. So, I think I’ll go back for day 4. Ok, that title may be a *bit* optimistic or even *slightly* misleading. I went to the gym today. First time. I guess that doesn’t quite qualify me as a gym rat or a regular. But, I do intend to go back. So that’s something. Just like a majority of Americans, the Hubs and I joined a gym at the first of the year. There’s a small gym by our house which is owned by a super nice guy who is really excited about helping me get healthy and in shape. He even moved weigh equipment around for me. We dutifully joined in early January. Today was the first time we went. I’m really good at excuses. “I don’t feel good.” “Tomorrow I have PT and don’t want to wear myself out.” “It’s Tuesday.” Whatever the situation, I can come up with a great excuse to talk myself out of going. I actually packed my gym bag one morning and went to the gym on my way home from court. I pulled into the parking spot which is literally in front of the door to the gym. I sat there for a minute and then chickened out. In my head, people were going to stare at the handicapped girl in the wheelchair and judge me for being there. The hubs has been busy with work and we hadn’t found any time to go to the gym (Sounds an awful lot like an excuse, I know). 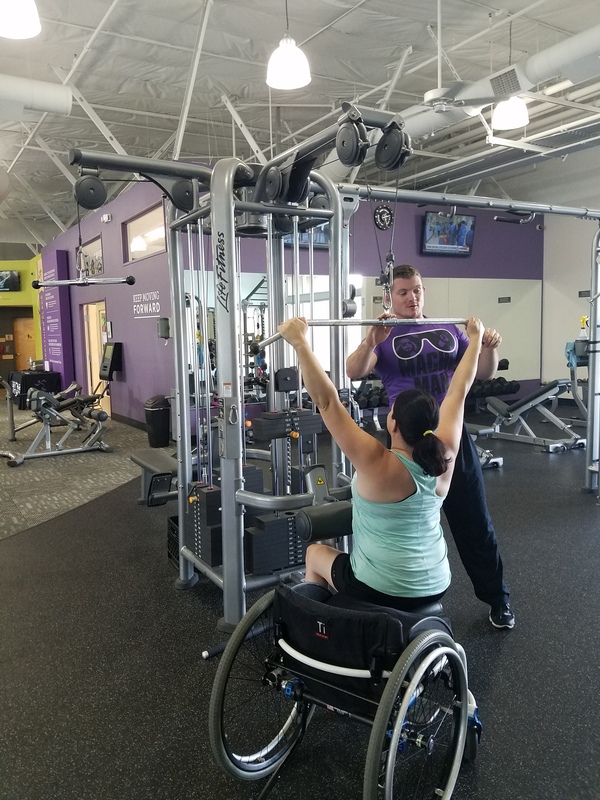 Going to the gym is always a good idea. I never get there and think “Man, I’m bummed I went there today!” Even if I’m sore, I don’t regret going. The soreness lets me know I actually did something! Cut to today- we decided to go. I put on my gym clothes as soon as I got up. That’s always half the battle. Luckily, the hubs as motivated to go. I’m always on the fence. It sounds like a good idea, but do I really want to? Today he wanted to. He put his workout clothes on which got our dogs super excited cause they thought it meant that they were going on a walk. So, 20 minutes later, after he returned from a quick walk with the dogs, we left for the gym. As we were parking, another car came into the handicapped spot next to us. Out comes an older man with one leg. Not even a prosthetic. Just one leg and crutches. The reason why this is noteworthy is because I kept seeing him all over the gym (again, it’s very small). He would balance on the one leg and do the overhead pull down bar weight thing (yes, that’s the technical term I believe). Nothing makes one feel like a whiner than to see a one legged man killing it in the gym. Talk about inspiration! I did my thing on the arm bike. I used to think the arm bike was kind of a weird machine. But now that it’s my go-to gym aerobics machine, I appreciate it. Talk about an arm, shoulder and core workout! The trick is to sit up (not propped up on the backrest) and flex your ab muscles the whole time. Yikes! 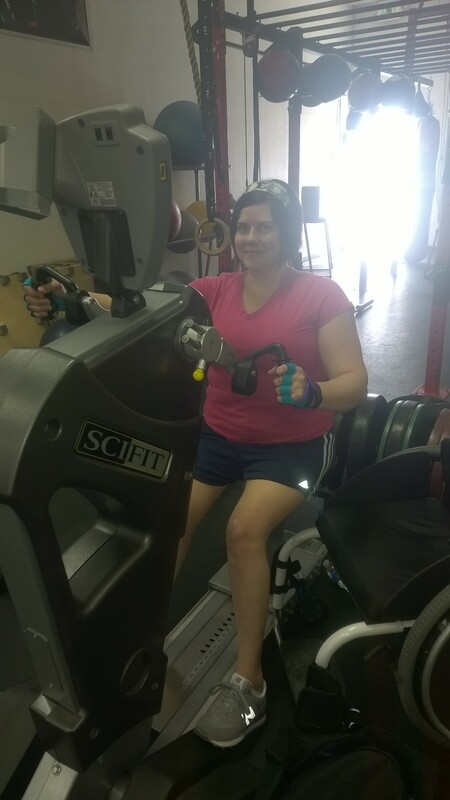 I also used a pec machine, which made me feel like I was going to fall off the little bench thing. I did not.